On the go mom and Nanni. Burt's Bees radiance facial cleanser with royal jelly Recommended? You Betcha! Almay Eye Makeup Remover Pads Recommended? You Betcha! 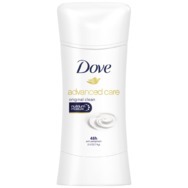 Dove® Advanced Care Antiperspirant Stick Original Recommended? You Betcha!